The first thing I have to say is that I’ve heard from Gerry, the biker I met on the ferry. He stacked his bike on the following Saturday in the south of France. Some minor damage to the bike but he suffered three cracked ribs and was airlifted home after a few days in hospital. So get well soon Gerry and I hope you make your trip on a later date. I’ll be thinking of you. Munich, capital of the Free State of Bavaria, that prides itself on its cycling friendly road layout. This two wheel user found it unnerving because they share the pavement with you., albeit on a marked cycling track. The trouble was that I kept forgetting about them and they don’t hang about! I kept having to leap for safety as` yet another mad tow wheeler exercised their right to be on the bit of pavement designated just for them. Truth be told, two days later and I was still forgetting about them. My nightmares featured tinging cycle bells. My first night in the shared dorm hadn’t been too much hassle. I was sharing a six bed room with two other guys and neither of them snored so a peaceful sleep was allowed. This is a new experience for me, one that I wasn’t sure how I’d find, but it’s been OK.
After breakfast I walked into the centre of the old city, following a map I’d found at reception. Usefully, the map was also a flyer for In Munich Tours, who conduct walking tours around the old city at 10.40 every morning. 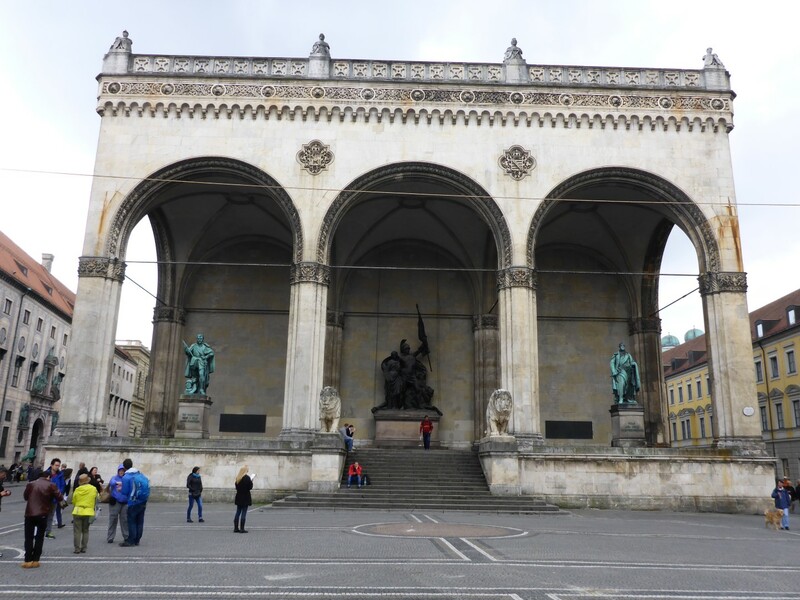 It seemed a great short cut to learning some history so I headed for the meeting place in Marien Platz. Adam is an ex-pat Aussie, living in Munich. He is a former professional yacht racer but the recession put paid to his sponsorship so he set up this business with a friend. They don’t charge a fee and you pay what you think the tour is worth when it’s over. I think this is a not uncommon approach but it left me wondering what I should pay. Once the tour was over it was much easier to decide because Adam did a fantastic job. Very knowledgeable and entertaining. The tour took three hours so was well worth the 15 euros I paid him. He told some great stories about the history of the city. Here’s a couple of them. In the 17th century a Swedish army swept across north and central Europe spreading Protestantism. As it approached Catholic Munich the ruler, Duke Maximillian 1st went to have a look at his opponents army, saw its size and strength, and promptly decided to scarper to Vienna rather than lose. So he took off, with his court and the city treasury, and left the citizens to it. In due course the Swedes swept in, unopposed, which usefully meant they had no need to damage the city. A few years late`r the citizens approached their Swedish masters asking what it would take to persuade them to leave. They demanded 400,000 gold pieces. The citizens did their best to raise the money but could only come up with 180,000. They asked the Swedes what they would take instead and they demanded 120,000 barrels of beer and 34 hostages. The ciriizens managed to meet this demand and the invaders left with their booty. As soon as they’d gone Maximillian crept back in, with the citize1ns naturally demanding to know why he’d left them in their hour of need. He explained that he’d spent all his time in Vienna praying to the Virgin Mary for the city’s freedom and it had clearly worked! He promised to erect a gold statue in the main square in gratitude to mary, which he eventually did. The statue sits atop a high column and is, in fact, gold plated. But the crafty Max hadn’t bought it, he’d stolen it from the tomb of one of his ancestors. How factually accurate this story is I’m not sure but it’s a great tale. The second one concerns the building of the Frauenkirche, know as the Devil’s Cathedral. The architect was geting behind with the work so the Devil appeared beside him one day and offered to assist provided the architect made sure he would not be able to see any windows. The Devil hated light. The architect agreed and when the cathedral was finished in good time he appeared to check his conditions had been kept to. To his rage he found there were many more windows installed than before. The architect pointed out that he had kept his bargain because none of them could be seen from where he and the Devil had stood when the deal was struck, they were all hidden by columns. 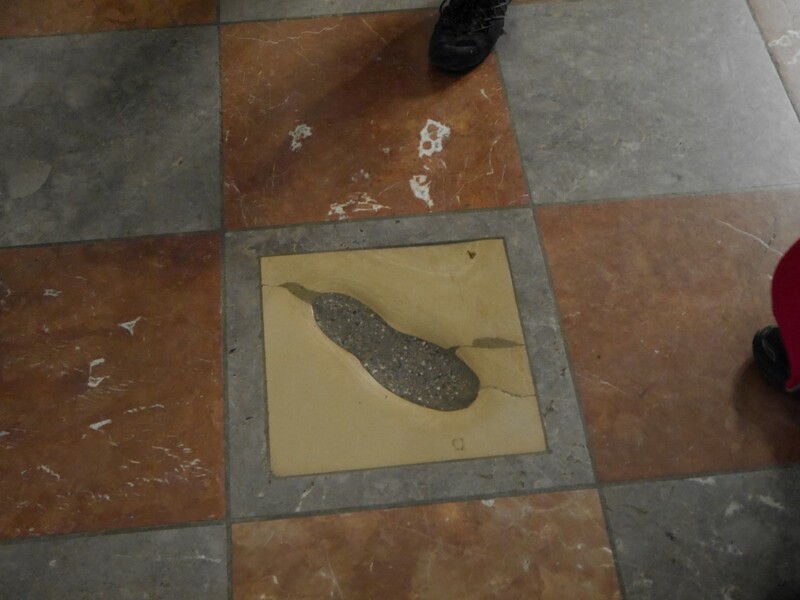 The Devil knew he was beaten and stamped his foot in rage, leaving behind a footprint in the floor. To this day the foyer is always windy, claimed to be ‘the Devil’s transport’. In fact the cathedral was built by the Devil because the money came from the Catholic church’s sale of Indulgences, money paid by people to have their sins wiped away. Sins are the work of the Devil therefore he paid for the cathedral. The Devil’s footprint? Just as likely to be that of the architect himself. A more recent story concerns Dodger’s Alley. There was a Nazi party attempt to take over the city in the early days of the party and three of its members were killed. When they came to power the Nazis set up a shrine to the dead outside the town hall and everyone was obliged to salute it as they walked past. 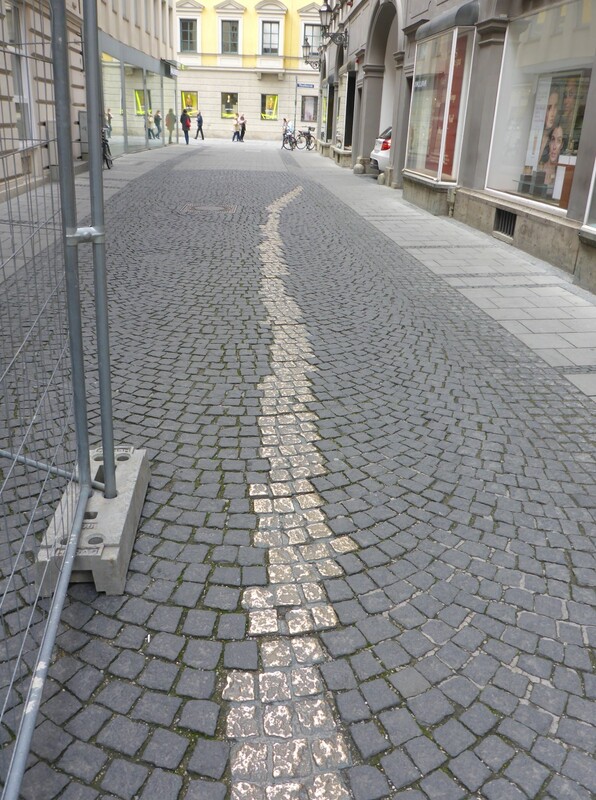 Many Germans were against the party but rather than risk being sent to Dachau concentration camp for refusing to salute, they used Dodgers Alley, which ran behind the town hall, thus avoiding the shrine. Eventually the Nazis got wise to this and members of the Hitler Youth monitored the alley and took the names of those who used it. If their name came up too often they were sent to Dachau anyway. But it was a clear demonstration of low level resistance to Hitler’s regime. Brass cobblestones to celebrate the Dodgers. Dodger’s Alley runs behind this building, to the left of the photo. 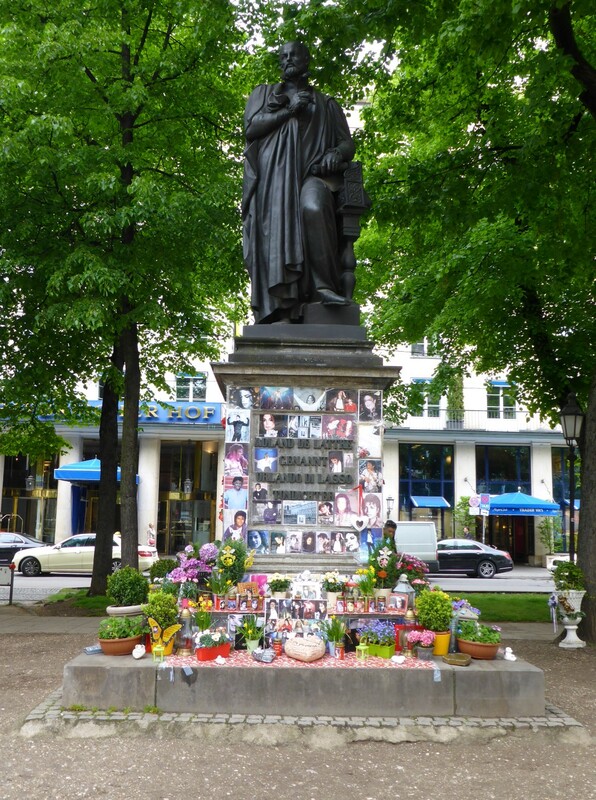 The weirdest thing we saw was a statue to a famous German scientist that had been hijacked by Michael Jackson fans after he died. The statue is opposite the hotel where he stayed when he performed in the city. This was the occasion on which he was holding his children up at the hotel windows. The statue is covered with Jackson memorabilia and photos. About as wacko as Jacko himself. The Wackos hijack a statue. 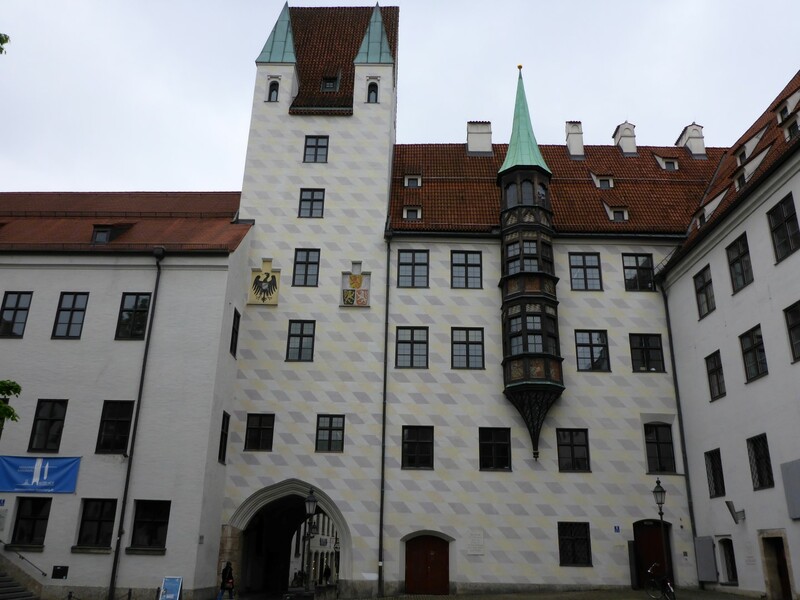 If you go to Munich and want to learn about the city, this is a great way to do so and I recommend In Munich Tours. 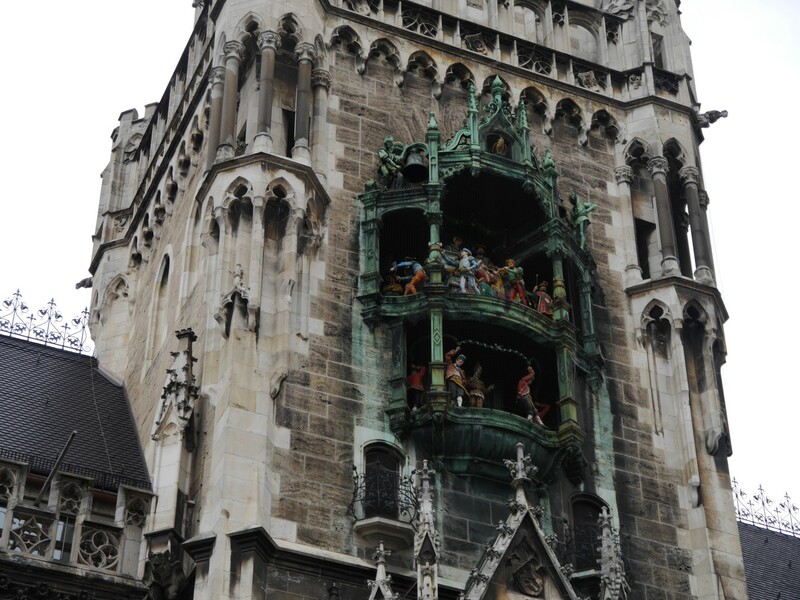 The famous Glockenspiel. Most of the bells are out of tune. I had planned to join a tour to Dachau, which lies just outside the city, the next day, run by the same company. Unfortunately I left the hostel a bit later than I intended but would have been there in time if only I hadn’t gone in the wrong direction! By the time I had turned back and gone the right way, it was too late. Is there a common theme developing here?? So I spent the day resting and catching up on some writing, route planning etc. That night the Bayern Munich v Real Madrid Champions’ League game was on the TV in the bar. There were some Germans in there, but they stayed rather subdued – no surprise! So what did I think of the city? A very interesting place to visit with a different strand of history to the rest of Germany, particularly in older times. It bears the unfortunate fact of being the birthplace of the Nazi Party but that doesn’t seem to have scarred it. It is still a very Catholic city and many of its monuments and much of its history reflects this. In his early days Hitler had wanted to train as a artist but was refused entry to the university. Here’s one of his efforts. This is the building that’s in the painting. Pretty good really. Statue of Juliet, a gift from the city of Verona. Was I ever NOT going to do that?! While I was in Bavaria I wanted to visit Berchtesgaden, Hitler’s summer retreat and Nazi Germany’s second seat of power. 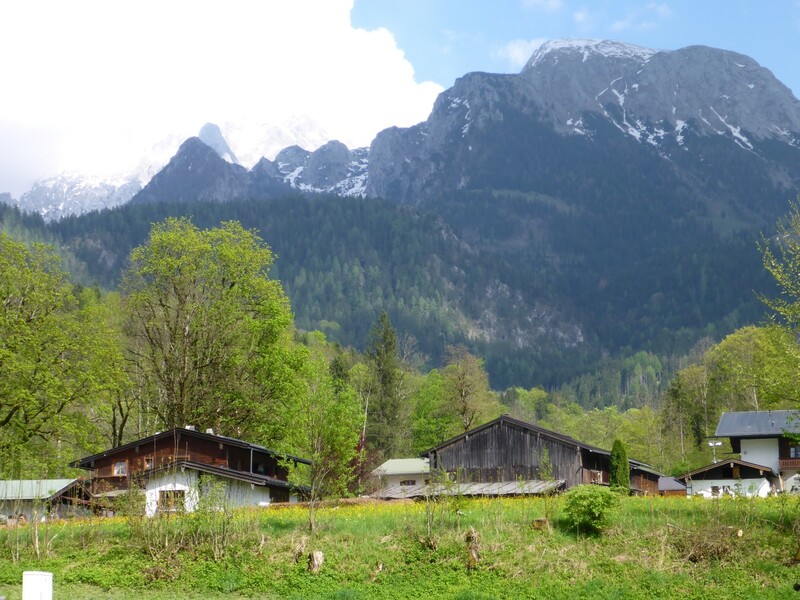 So I set off the next day for a very pleasant ride down to the foothills of the Bavarian Alps and ended up on a nice campsite, just outside Berchtesgaden, a stone’s throw from the Austrian border. No wi-fi on this campsite but there was a McDonalds just outside the gate and while normally I would be horrified by such an intrusion into a beautiful landscape the one hour free internet access made up for it somewhat and the coffee they sell isn’t too bad. So I forgave them. Intrusive use of yellow Mr McD. But I liked your wi-fi. This is the view from my tent at Berchtesgarten. Getting up early to try and leave a campsite in good time is a mixed blessing. Firstly, it’s cold that time of day, this time of year. But I don’t wimp out and after porridge and tea, I feel human and warm. Then the fun starts – packing up and loading the bike. I’m not a hugely experienced camper (yet) but I still can’t fathom how it takes three hours to get up, ablute, eat, pack away and load the bike. But it does! This is something to work on because it’s just too much time out of my day. So by 10am, I’m on my way up the road a few kms to Obersaltzburg, the nearby village where Hitler first had a summer retreat in the late 1920’s. He used to rent a cabin and it’s where he finished Mein Kampf. After he came to power he bought a small villa there and over time it became his second seat of power, after Berlin. It was rebuilt and extended and became The Berghof. Eagle’s Nest, from the document centre. The village used to get crowded out by hysterical Hitler followers, just like a modern pop star, much to the annoyance of the residents. Eventually the Nazi Party started buying up the properties in the village so they could convert it into a protected area. Some villagers sold up willingly, and got a good price, others resisted and were forced out and lost out financially. 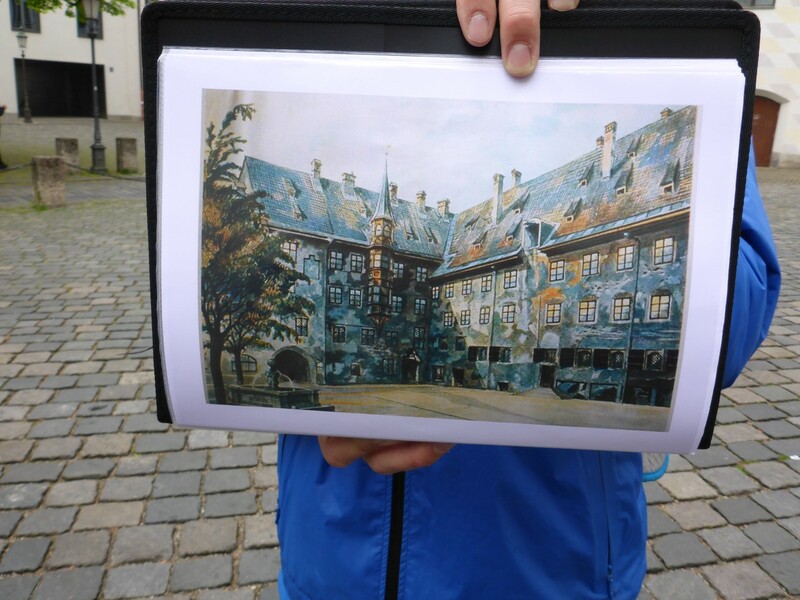 The owner of the hotel didn’t sell until he was ‘persuaded’ by a three week visit to Dachau. A complete complex of administration, security and government was built and it was here that many of the Nazis’ worst schemes where proposed and planned. In 1938 the infamous Kehlsteinhaus (dubbed the Eagle’s Nest by Allied troops) was built on a mountain top nearby. It was a huge vanity project organised by Martin Bormann as a gift from the Party to Hitler for his 50th birthday. It’s reckoned he only went there 17 times but it was used to impress foreign dignitaries and other important visitors, like Neville Chamberlain and Mussolini. It was also used for propaganda events, such as when Hitler met youth groups, to portray himself as the Father of the Nation. These events were filmed and photographed for the enervation of the German public. Mostly, it was used by Eva Braun who entertained her family and friends there. She was never allowed to be around Hitler when he was entertaining guests and foreign dignitaries. There were only two or three senior Party members who knew of her presence there at all. The Eagles Nest had to have a special 6km long access road carved out of the hillside and there was a 124 metre long tunnel at the end of which was a 124 metre long vertical shaft which carried a lift up to the building. The whole thing cost around 30 million Reichmarks and was a real megalomaniac project. 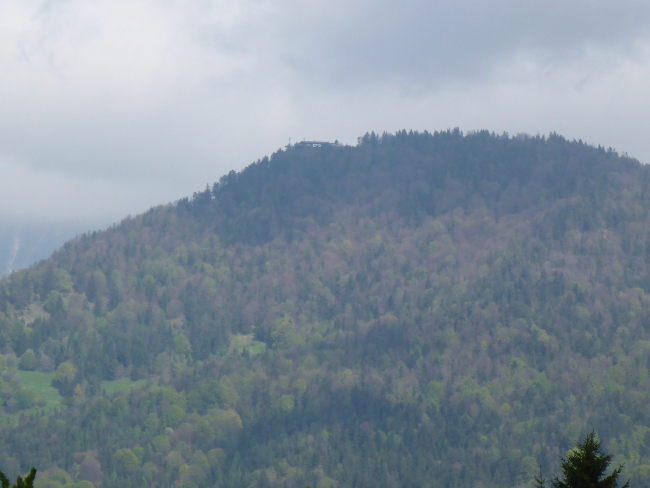 Unfortunately I was there too early in the year to visit the Eagle’s nest. It doesn’t open until mid May, after the snows have gone and the engineers have had a chance to clear, and make safe, the access road. Special buses cover the route and it’s the only way of getting there. However I was able to visit the Document Centre at Obersaltzburg. This is a centre of guided learning and remembrance set up by the Institute of Contemporary History, Munich-Berlin. Its aim is to inform and educate the visitor, in an academically sound but understandable way, of the events that took place there but also links Obersaltzburg to the central activities of the Nazi Regime. It is housed in a building built on top of, but including, the underground bunkers that were part of the complex. Just before the war ended, Allied bombers attacked the complex and destroyed most of the buildings. The remaining ruins were blown up in 1952, as much as anything to prevent a shrine being created to Hitler. The Eagle’s nest was not damaged and the whole area was returned to the Free State of Bavaria when the Americans finally left in 1996. The centre was then created. It contains a huge range of documents, photos and films showing the rise of National Socialism, the Cult of the Fuehrer, the Machinery of Terror, Hitler’s foreign policy and the second world war. The information is written in English and German and an audio guide is also available in English. For anyone interested in the the history of the time it is a fascinating place to visit and I spent a couple of very enjoyable hours in there. 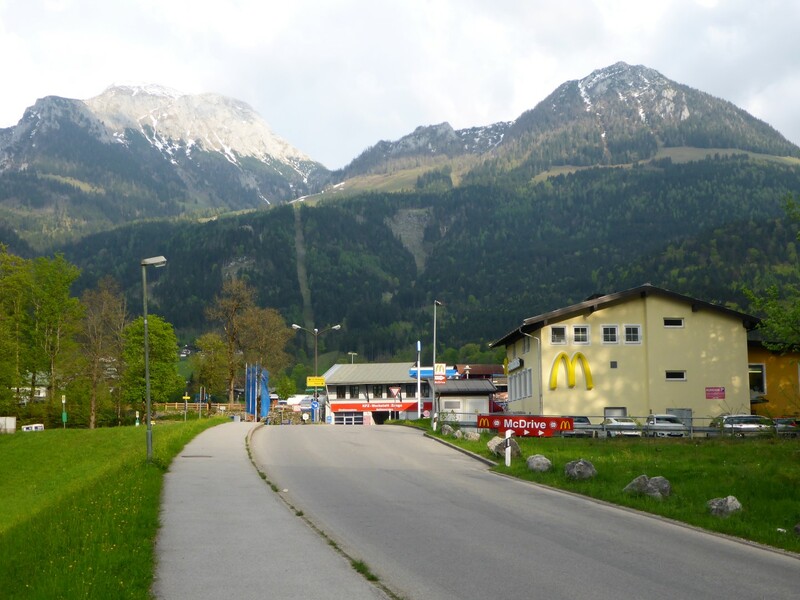 Onwards from Berchtesgaden, leaving the Alpine foothills behind, sadly. But the countryside was very pleasant with green fields and pretty villages. Swiss Chalet style houses were still the norm and I saw several people in traditional costume in some of the villages. The roads were busy and there were loads of bikers out and about. This puzzled me until I realised it was probably the Mayday bank holiday. Stopping for fuel, I enjoyed a lunch time roll at the garage, along with coffee and cake. Many of the German petrol stations sell very nice food too and often have a seating area. Rather than pies and chocolate bars, they sell freshly filled rolls and slices of freshly made cake to go with the very nice coffee. Please take note Shell, BP and Esso! Doing some fuel consumption calculations showed I had been getting 74mpg, even over some of the previous day’s hills and bends. Excellent results, well done Doris! That night I found a campsite way up in the hills just near to the Czech border. It was a bit run down but had the essentials. I knew it was going to be cold that night – and I was right! Thank heaven for Merino Wool long johns! The target for the next day was to enter the Czech Republic (hereafter referred to as CZ – I’m lazy!) and reach Prague. It had rained overnight so I had to pack away a wet tent but luckily it wasn’t raining while I did it. Oh, the joys of camping! Crossing the Czech border was no different to any other EU border – just a generic EU sign telling you the name of the country you’ve just entered and a reminder of their speed limits etc. But it felt special to me because it was the first proper new country I’d arrived in on this trip. I’d been to all the others before but here, the new experiences started. The first one was stopping for coffee, paying in Euros and getting CZ Crowns as change. When you ask for coffee in CZ you get an espresso. Or a double, if you order it. It comes with a small carton of milk, plus sugar. The menus don’t seem to include latte, cappuccino or any of that fancy stuff. Coffee is coffee and that’s your lot! I’ve grown to like espresso, much to my surprise, and I’m happy to take it as is, no milk or sugar. It’s surprising what you can get used to when you have to. The second, pleasant, surprise was the price of fuel. Just over a pound per litre and diesel about the same. Woo Hoo! Cheap motoring! The garages take credit cards, of course, and are as modern as those anywhere else. I didn’t know what to expect with regards CZ to infrastructure but it’s over twenty years since the velvet revolution and ten years since they joined the EU so they’ve had plenty of time to become a modern EU country. Except for fuel prices. Well done CZ! Reaching Prague after a nice ride through farmland and woods, I headed for ‘Centrum’ to look for a Tourist Info office. These all have the EU standard green ‘i’ outside them so are usually easy to find. As I headed further in I found myself near the main station and managed to find a place to park up and walk in, expecting to find one in there. I was right and I asked about accommodation. The reaction was, essentially, ‘You’re ‘avin a Giraffe mate!’ I’d reached Prague on Friday 2nd May and as the day before had been the Mayday bank holiday a lot of people had decided to make a long weekend of it (Faire un Pont as the French would say) and Prague was full. Cheapest room was Eu230. Not for me, ta! The woman behind the info desk suddenly said to me ‘You can stay at my place if you like.’ She was an attractive young woman, in a big and bouncy sort of way, and my mind, and pulse, raced for half a second. But I soon calmed down when she qualified the statement by saying that she had a spare room that she made available to visitors. I said I needed two night’s accommodation but it was only available for one. Also, I’d have had to wait until she finished work at 8pm before I could go there. Hanging around in my riding gear on a warm afternoon for just the one night didn’t appeal so I passed on it. But I never quite managed to work out in my mind the situation behind this. She said there would be no charge and offering a spare room to complete strangers when you work on a tourist info desk strikes me as a bit strange but it will have to remain a mystery. While I was riding into the city I had spotted a campsite sign so I figured that would have to do. I headed back out, the thunder and rain started up, and I got to the site a bit wetter than I wanted to be and pitched my tent. The reception provided very comprehensive info on getting into the city by tram and also sold the tickets so after getting organised I bought a ticket and headed in to see what the city had to offer. That will do for now. Tales of castles, cathedrals and Czech culture to follow soon. So interesting Geoff’ thanks for sharing. Love all the stories. Keep blogging. Stay safe. Thanks Graham. More to follow soon. You write exceptionally well, Geoff – very interesting and informative stuff. It must be due to the excellent education you had at Crown Woods! Almost certainly the case David. Plus I’m going to interesting places and getting well informed there. It always helps.